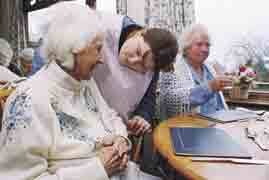 Dementia is caused by loss of brain function provoking impaired mental ability and cognitive difficulties. Patients find it increasingly difficult to process new information, suffer from memory loss, and have problems with reasoning, judgment, perception and awareness. Alzheimer's disease is the most well-known and common form of the disease, but a lack of oxygen to the brain caused by stroke or lack of blood flow provoked by hardening of the arteries cause Vascular dementia and there are other types, including Lewy body which are less well-known and we have less research information about. According to the he International Council of Nurses (ICN), this condition can also be the result of HIV-related illness; Pick’s, Huntington’s or Creutzfeldt-Jakob disease; excessive alcohol use; or metabolic imbalances. The ICN reports that “Most forms of the condition, like that due to Alzheimer’s and Lewy body disease, are progressive and irreversible; however, some types, such as that due to metabolic imbalance or vitamin deficiency, may be reversible if caught and treated early”. loss of initiative or ability to think things through without help. 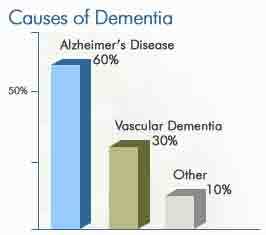 Dementia is not a normal part of aging. Before making a diagnosis it is important to rule out other problems which might be responsible for the symptoms such as thyroid gland dysfunction, infections, alcohol abuse and depression, to name just a few. Memory loss is common if one suffers from depression or has many problems or tasks to deal with simultaneously and does not mean a person has dementia. Additionally, some but not all older people need more time to assimilate information, which may affect their capacity to learn and remember things. The symptoms leading to a diagnosis of Alzheimer's disease include memory loss, (first of all the short term then mid-term and gradually full memory loss), a gradual decline in the ability to take care of personal hygiene and routine tasks, impaired judgment, disorientation, personality change, problems learning new tasks, loss of language skills and difficulties in recognising people who are well known. These changes take place at different rates depending on the patient but usually the disease eventually renders sufferers entirely incapable of looking after themselves and leaves them in need of full-time care. It is not known what causes Alzheimer's disease and diagnosis is made on the basis of eliminating other possible reasons for the problems from which the patient is suffering. Normally tests will be made to eliminate diseases such as depression or anxiety disorders, and other problems such as adverse drug reactions or nutritional deficiencies. Doctors also try to rule out head injuries and may do a brain scan to see if the patient has suffered a stroke or series of small strokes causing vascular dementia. Only dissection of the brain after death can prove without doubt whether or not the person had Alzheimer's as the biopsy will show tangles and plaques in the brain. These can also be observed in people without Alzheimer’s disease but the number and size in people with the disease is the clinical evidence needed to make a diagnosis. Also, although brain shrinkage increases with age in all people, there is also a great deal more atrophy shown in people with the disease. Researchers are currently trying to find out if there is a gene or genes responsible for the disease and also investigating other suspected causes such as virus or other infection, environmental toxins or other agents, such as problems with the immune system or whether the disease can be provoked by chemical agents. Who can be affected by Alzeimer’s Disease? Alzheimer's mainly affects people who are in their late 60s or older, but has been known to affect much younger people of both sexes, sometimes even striking people only just into their 40s. According to Alzheimer’s Disease International, approximately 18 million people worldwide live with dementia, with Alzheimer’s disease accounting for more than half the number of cases. Alzheimers or its complications is the fourth most common form of adult death worldwide, after heart disease, cancer and strokes. The disease can strike down people from all walks of life and with different academic abilities. It also appears to affect both sexes equally. Though some studies show a slightly higher prevalence rate of Alzheimer’s disease in women, this is because it is a disease which is more common as one ages and, in general, women tend to live longer than men. The course of the disease usually runs from two to 10 years, but can take as long as 20 years. During the later stages of the disease, 24-hour care may be required with such basic activities as eating, grooming and toileting. Although no cure for Alzheimer's disease is available at present, good medical and social management can ease the burdens on the patient and family. A drug called Aricept is known to delay the disease for a short period – up to two years, but when the drug no longer works, deterioration and decline is usually more rapid. Patients are often given anti-depressants or anti-anxiety medication which treats depression, calms agitation and lessens unpredictable behaviour, making the patient easier to manage. Physical exercise and social activity are important, as are proper nutrition. Patients do best in a calm, comfortable, and well-structured environment with as little change in routine as possible.